Elizabeth Rowell was born in 1915 and she, like her mother Bertha, was a woman ahead of her time. 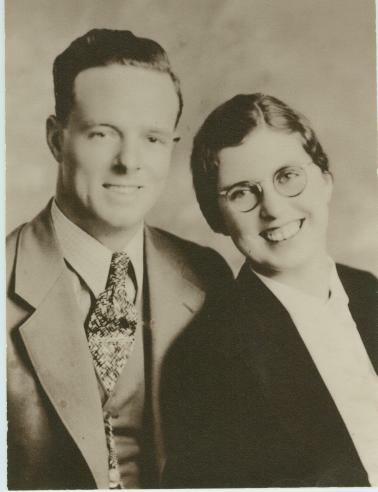 Elizabeth was so dedicated to both her parents, especially her dad Harry, that her dedication to her family and heritage would be the break up of her marriage. 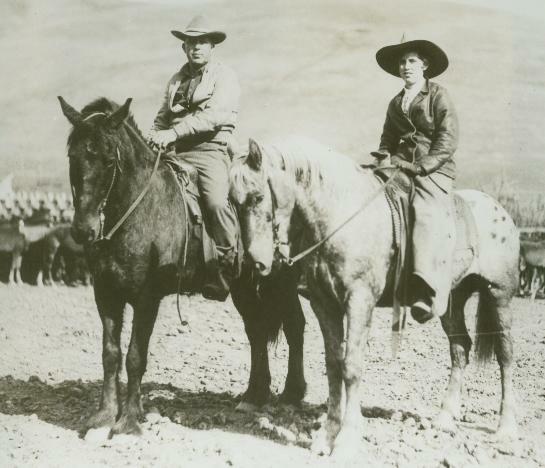 Elizabeth was as much an intricate part of the success of the Rowell Ranch and it's businesses as her parents. Later that night, Dogtown was having a drink with Harry and Elizabeth came into the room and Harry introduced Elizabeth to Dogtown. She was dressed all in white with a red rose corsage. Dogtown told her that she looked like an angel and they were married on September 2, 1937 in Fallon, Nevada. The night of their wedding Harry had a big "surprise" for both Elizabeth and Dogtown. The "surprise" was that Harry was going to have the local sheriff arrest Dogtown and keep him in jail overnight. Dogtown and Elizabeth found out about it and left for Reno where a reception was quickly organized by some friends. Elizabeth and Dogtown returned to the Rowell Ranch and Dogtown went to work for Harry at the slaughterhouse, on the ranch and promoting the rodeos. He also would go to Texas and buy bulls, cows and roping calves for Harry. Dogtown had a great deal of respect for Harry Rowell, however, there were a few family disagreements. 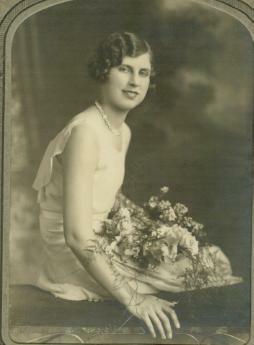 The biggest one was the night that Elizabeth gave birth to their daughter Harriett (named after Harry). Dogtown and Harry were at Boero's Dublin Hotel and Restaurant sharing a few while Elizabeth was in the hospital. Harry, always ready to take a gamble, bet Dogtown that if it was a boy he would buy the drinks and if it was a girl Dogtown would buy the drinks. After a few too many, Harry told Dogtown that he may be the Daddy, but Harry was the Grand Daddy and that Harry could whip Dogtown. Dogtown replied to Harry that he really did not want to do that. However, with the few drinks had by all, Harry got a little pumped up and told Dogtown that he thought he was a "yellow, Texas Sonnabitch". Dogtown could handle the yellow, but the insult to his mother and his native State of Texas was a little much. What followed was a brawl in the chicken pens outside the hotel that lasted almost the whole day. Dogtown was about 25 at the time and about 200 pounds. He was strong from bull dogging, but Harry at age 40, was still athletic and 6'3" and about 260 pounds. The fight ended in a draw with both men exhausted and beaten. When Elizabeth and Bertha found out the next day what had happened, they received a verbal beating worse than the one they had inflicted on each other. A couple of days later Harry met up with Dogtown and apologized. Elizabeth and Dogtown moved to Texas for a while so that they could try and build their own ranch. However, Elizabeth missed her father and after her mother died wanted to move back to California to be near him. 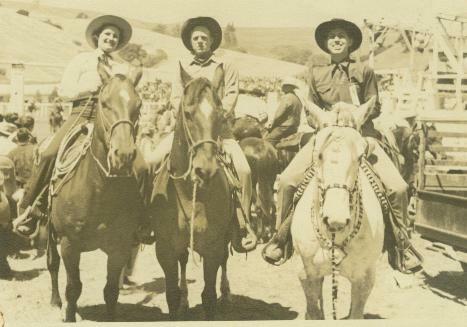 They moved back, but a year later Dogtown wanted to go back to Texas to start his own ranch. They divorced in 1955. Like her mother, Elizabeth worked hard and long hours. The lifestyle she lived eventually caught up with her and she died at age 42 - just like her mother. Elizabeth left behind a daughter Harriett and three grand children - Sonny, Desiree and Paige and one great-grandchild CJ. Elizabeth Rowell on her parade horse with her parade saddle made by The Rowell's Saddlery especially for her. It was very special to her. Her descendants have no idea what happened to it after Maggie died. Note that Elizabeth Rowell, age 14, will be performing. At age 14 she is well-known accomplished bronco buster and will be taking part in some of the races that will be held during the Hayward Rodeo. Doughtery Train Station near Dublin, she and DutchBartram (one of Harry's best friends and faithful employees) would drive down to the station and get two horses out of the cattle cars. They would saddle these wild horses and break them right at the train station and use them to herd the remaining horses back to the Rowell Ranch. 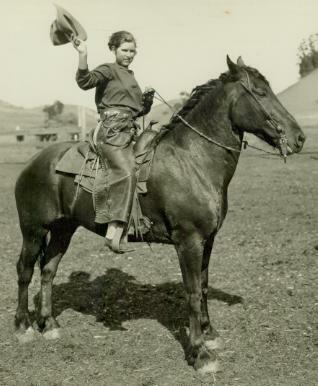 When Harry & Bertha starting in the rodeo stock contracting business, Elizabeth would travel from rodeo to rodeo with the bucking stock and act as the rodeo secretary keeping score and writing checks to the cowboys. 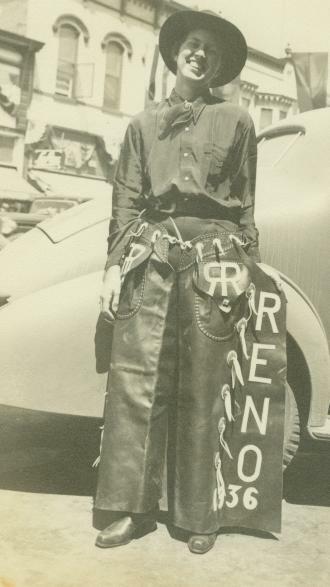 Although she never participated in any of the rodeo events, it was well known that she could ride as well as any of the cowboys who were competing in the rodeo. 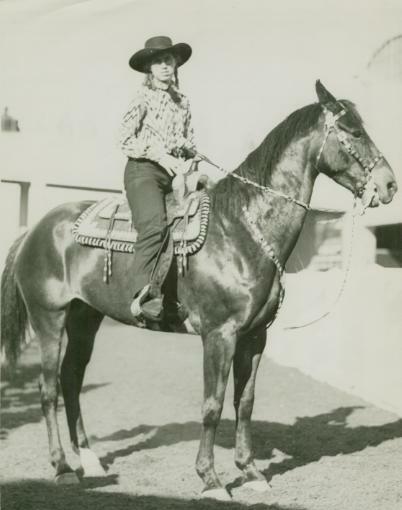 Elizabeth was instrumental in promoting the sport of rodeo along side Harry and spent many days and nights traveling by truck and pulling trailers loaded with horses and bulls to perform at the rodeos. Elizabeth met C.O. "Dogtown Slim" Leuschner at the Sonora Rodeo in California. Harry and Elizabeth were there as stock contractors. Dogtown went into the office to pay his entry fees for the bull dogging event. 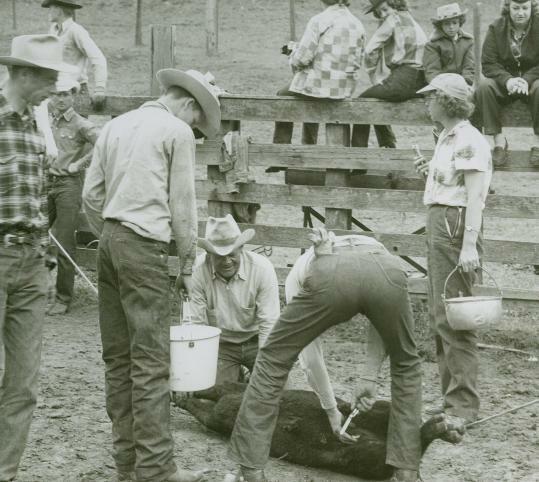 He had been doing some work for Harry behind the chutes and told Elizabeth to charge his entry fees to his labor. Of course, Elizabeth did not know who he was, but she accepted his entry anyhow.